Ah, a long weekend and lots of good things happening, none the least being some hobby-related work. Time for a bit of a look back at the last few months, see what's on the go right now and have a think about the rest of the year. 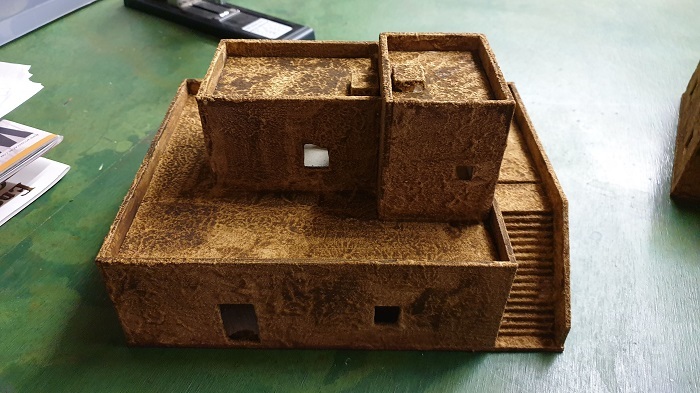 The last six months were focused on terrain building in preparation for Little Wars at the beginning of June. It was lots of fun and I was really happy with some of the pieces and am looking forward to putting them to use in the future. I also painted around 50 individual miniatures which have added a lot to the 'playable' collection. Speaking of the collection, for my birthday I was given two metal filling draw sets. Over the last month or so I've been magnetising my collection so they can leave their old Ikea plastic tubs (where they were being slowly but surely ruined) and now sit securely in their own organised draws - I think I'm going to need a third set of draws before too long, especially if I'm going to magnetize the Lizardmen army (100-odd models!!) - I just ordered another 200 N50 magnets then, good thing they're cheap! there is no such thing as too big a gun. Speaking of needing more storage for the war toys, this weekend I made a start on my Eldar army. Many of the models I had purchased over the last year were second hand, quite likely painted anytime from the late 80's till recently. 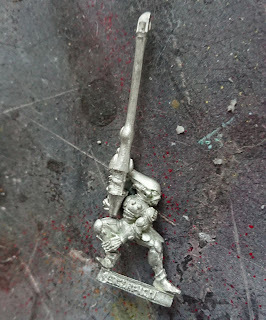 So this weekend I started my first batch of stripping the paint of around a dozen models and some repair jobs as well - when acquiring models of this vintage, it's not uncommon for them to be missing an arm, hand or head. Here's a shot of my very first attempt at mod'ing an Eldar out of necessity. I know that's a Striking Scorpion model and as I was short one right-arm, I substituted what is either a Bright Lance or Shining Spear. 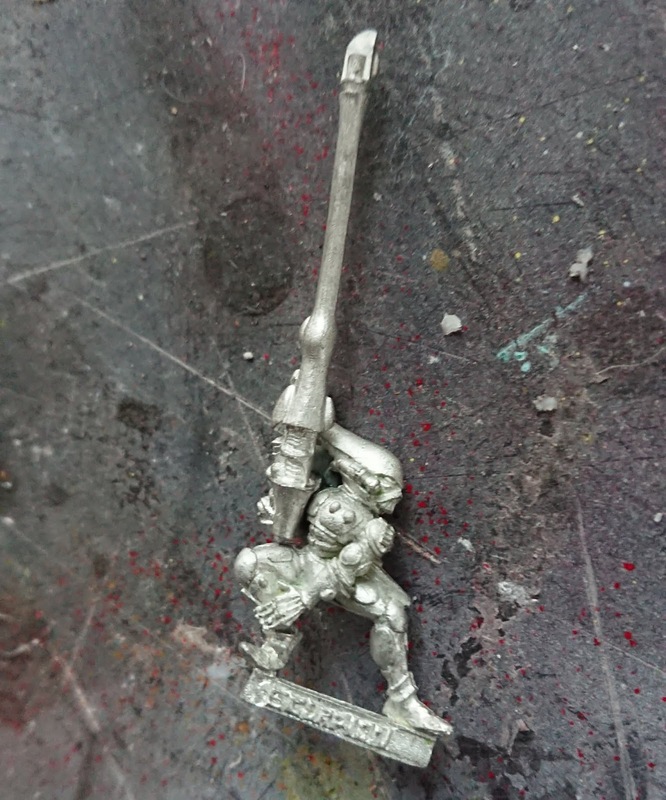 Yeah, it is almost twice as tall as the model, but the way it rests upon his thigh is awesome - I think I may even try and model a banner fluttering off the barrel as well. A Howling Banshee who's lost her sword also received a substitute today, unfortunately, something a little more subdued. The Eldar are going to be my primary hobby project for the year. There might be 100 models all up and about the only models I'm still seeking are metal Wraith Guards. Other than that I've got an old skool Dreadnought, a plastic Wave Serpent, two Viper Jetbikes and more than enough Guardians and Aspect Warriors to keep me busy for a long time to come. I'm really looking forward to it and playing Rogue Planet means I can legitimately paint up small sections at a time. I also acquired Space Hulk this year - two copies in fact! The 3rd Edition is very ornate and the models extremely detailed; just getting them off the sprue and cleaning is going to take me more than a couple of evenings methinks. I intend to paint the whole 3rd Edition set and then play it regularly. In the meantime, the 2nd Edition set will keep me and the kids going for a long time to come... in due course I may even paint up that set and gift it to a nephew or something :-) that would make a pretty special Christmas present.